​Any SOLD OUT rosaries can still be ordered, but will take an extra 2 weeks for delivery. 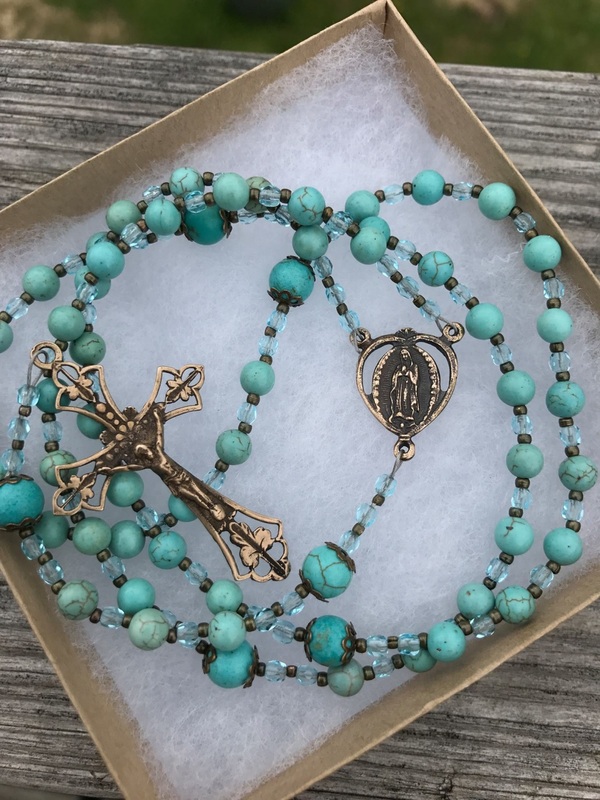 This is a full 5 decade rosary made with 6mm Turquoise Agate Ave beads and 8mm faceted glass Pater beads, solid bronze crucifix and Miraculous medal. 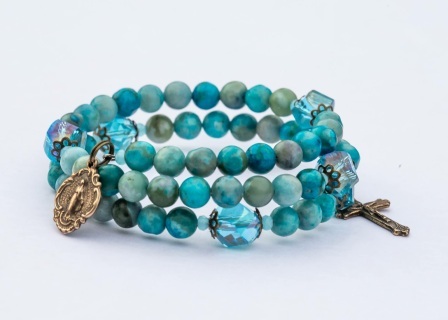 This rosary bracelet is made with 6mm Aqua Terra gemstone beads. 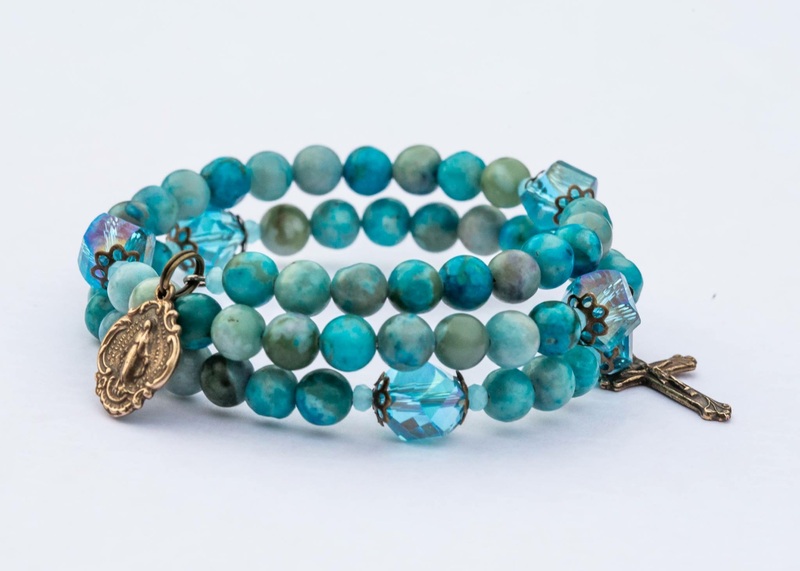 Paters are 8mm Aqua Terra gemstone beads. The bead caps are antique brass. The St. Gerard medal is 3/4 inches long and the crucifix is 3/4 inches long. They are solid bronze and are hand cast from antique vintage pieces. One of a kind original creation. This is a full 5 decade rosary made with 6mm Red Creek Jasper gemstones, brass Pater beads, solid bronze crucifix and Miraculous medal. This is a full 5 decade rosary made with 6mm dyed Turquoise Ave beads, 8mm dyed Turquoise Pater beads, solid bronze crucifix and Our Lady of Guadalupe medal. This is a full 5 decade rosary made with 6mm Sodalite gemstones, 8mm Lava stone Pater beads for essential oils, solid bronze crucifix and Saint Teresa of Calcutta solid bronze medal. 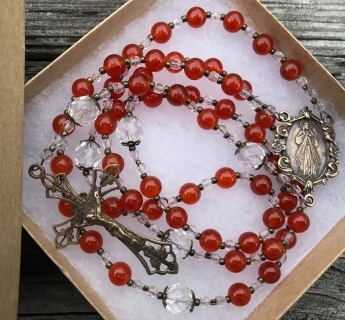 This Divine Mercy rosary is made with 6mm Carnelian Ave beads. The Our Father beads are 8mm Czech Fire Polished beads. The rosary center is 1 inch long and the crucifix is 1 3/4 inches long. They are solid bronze and are hand cast from antique vintage pieces. One of a kind original creation. 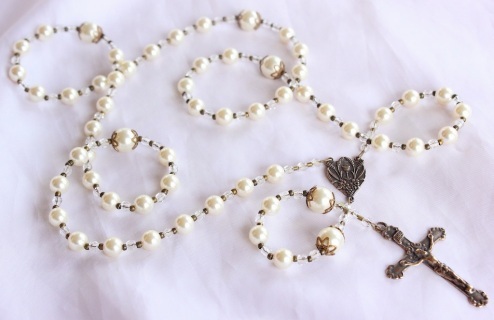 This First Holy Communion Rosary is made with 49 strands of stainless steel, nylon-coated flexible wire. Aves are 6mm Swarovski Crystal pearls. 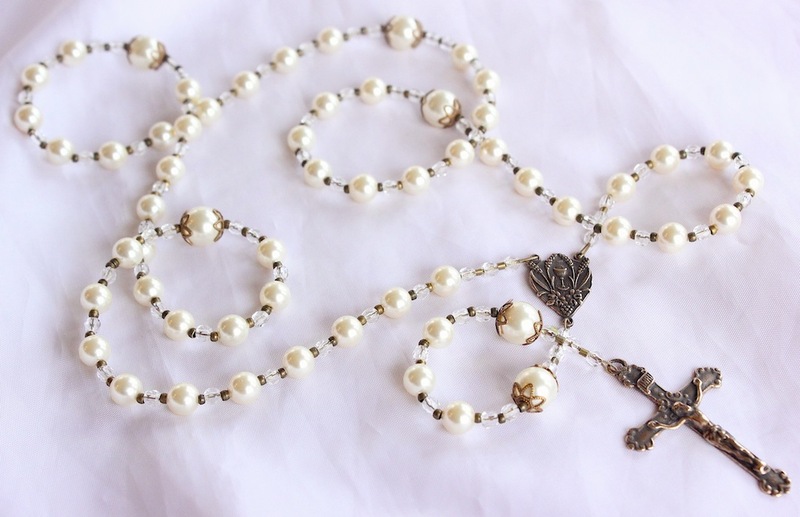 Paters are 8mm Swarovski Crystal pearls. The 1 3/4 inch Crucifix and 7/8 inch Eucharistic center are solid bronze and are hand cast from antique pieces. Made with 49 strands of stainless steel, nylon-coated flexible wire and double crimped with solid brass crimp beads for extra security. One of a kind original creation. This baby's rosary is made with 49 strands of stainless steel, nylon-coated flexible wire. Aves are 6mm Riverstone beads, Paters are 8mm fire polished glass beads. 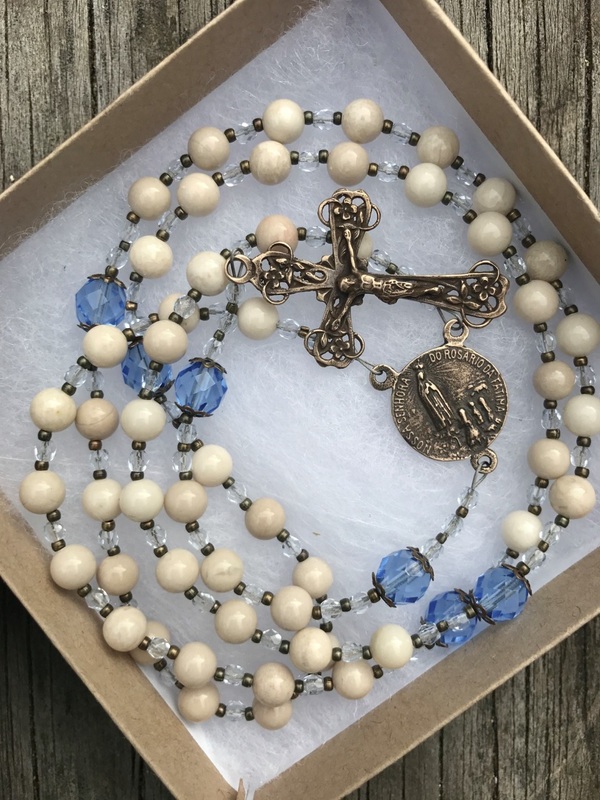 The double-sided 1/2 inch rosary center and 1 1/2 inch crucifix are solid bronze and are hand cast from vintage antique pieces. One of a kind creation. 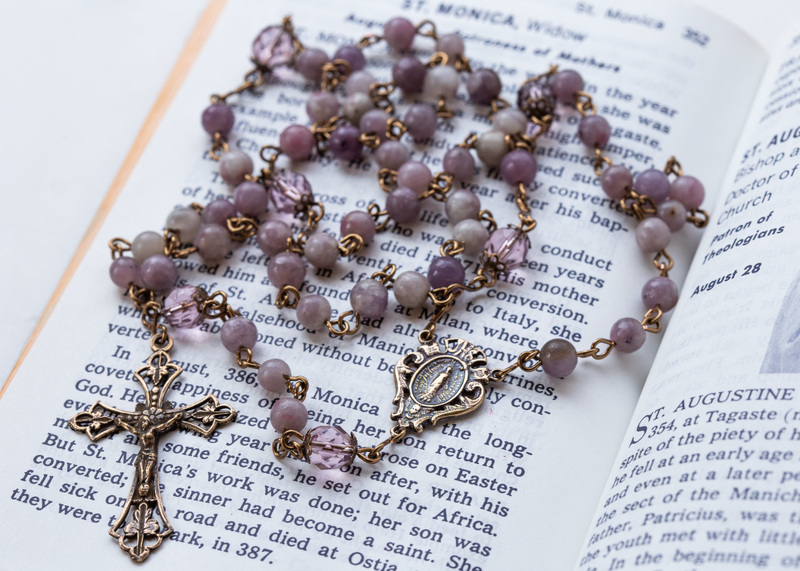 This bronze rosary is made with 49 strands of stainless steel, nylon-coated flexible wire. Aves are 6mm imitation Turquoise beads. 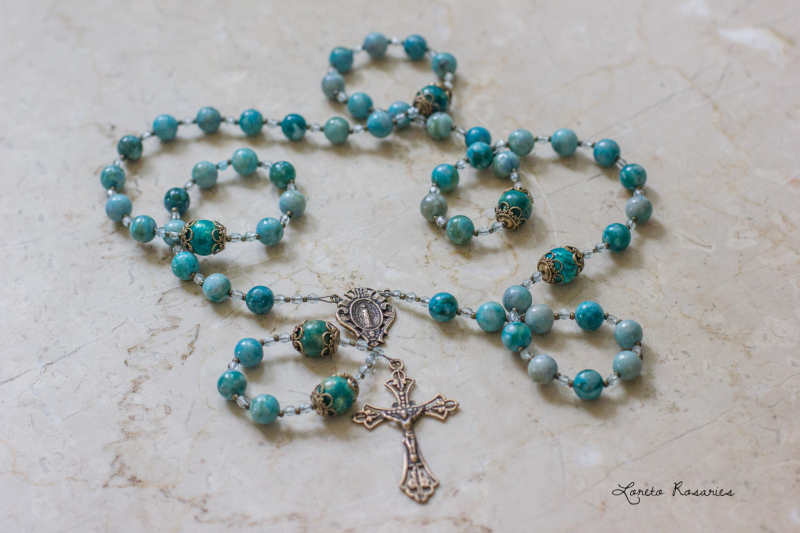 Paters are 8mm imitation Turquoise beads. The bead caps are antique brass. 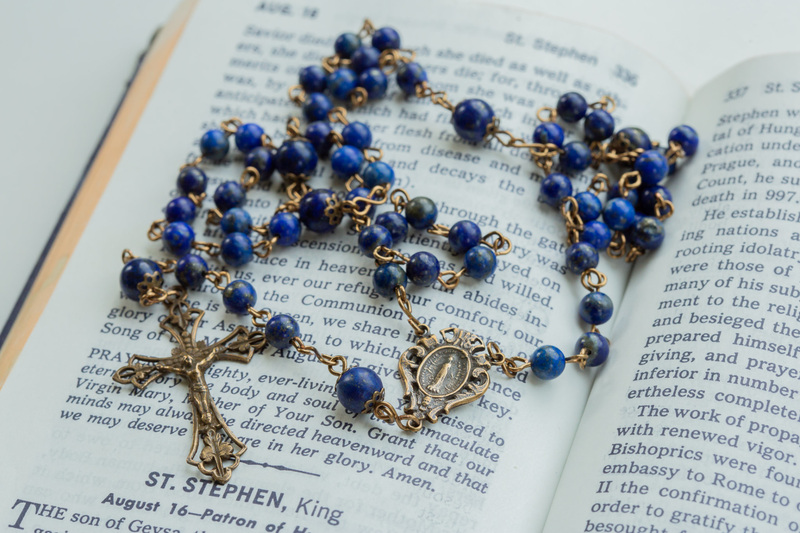 The rosary center is 3/4 inches long and the crucifix is 1 3/4 inches long. They are solid bronze and are hand cast from antique vintage pieces. One of a kind original creation. 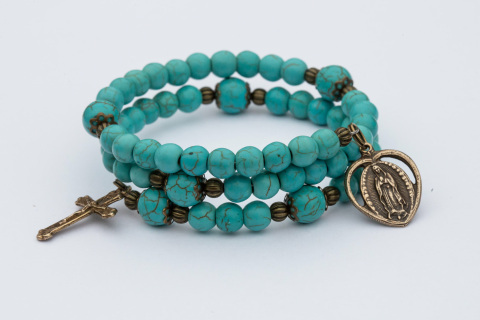 This Our Lady of Fatima rosary is made with 49 strands of stainless steel, nylon-coated flexible wire. Aves are 6mm Riverstone gemstone beads. Paters are 8mm fire polished crystals. The bead caps are antique brass. The Our Lady of Fatima center is 1 inch long and the crucifix is 1 3/4 inches long. They are solid bronze and are hand cast from antique vintage pieces. One of a kind original creation. 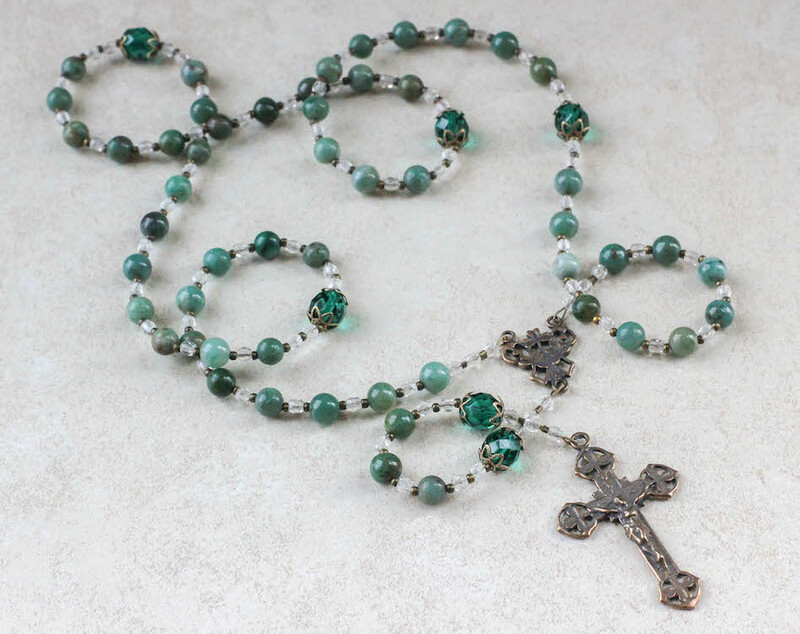 This Irish rosary rosary is made with 6mm African Jade gemstone beads. 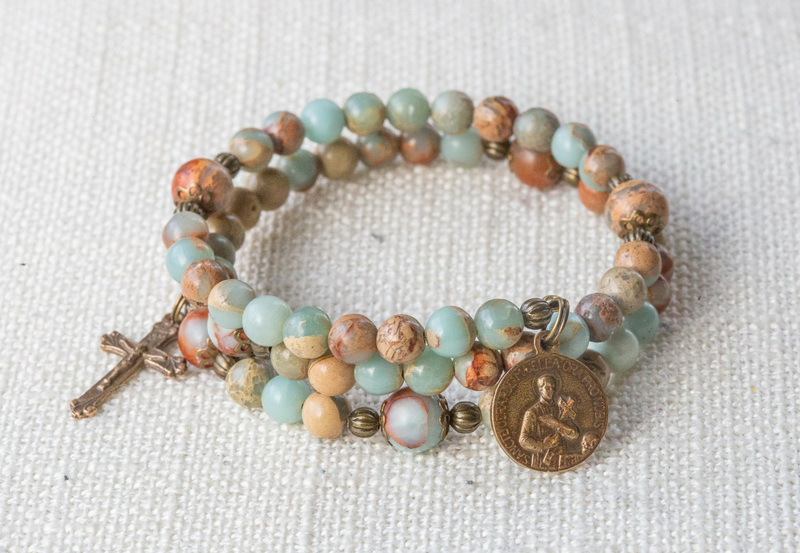 The Our Father beads are 8mm Czech fire polished beads and they are capped with antique brass bead caps. 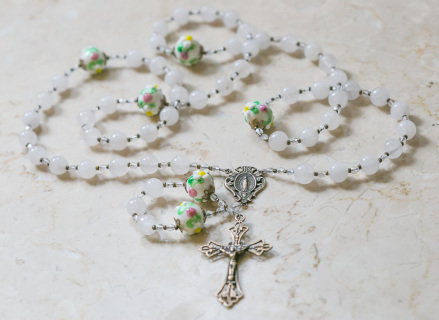 The Shamrock rosary center is 3/4 inches long and the Irish Shamrock crucifix is 1 3/4 inches long. They are solid bronze and are hand cast from antique vintage pieces. One of a kind original creation. 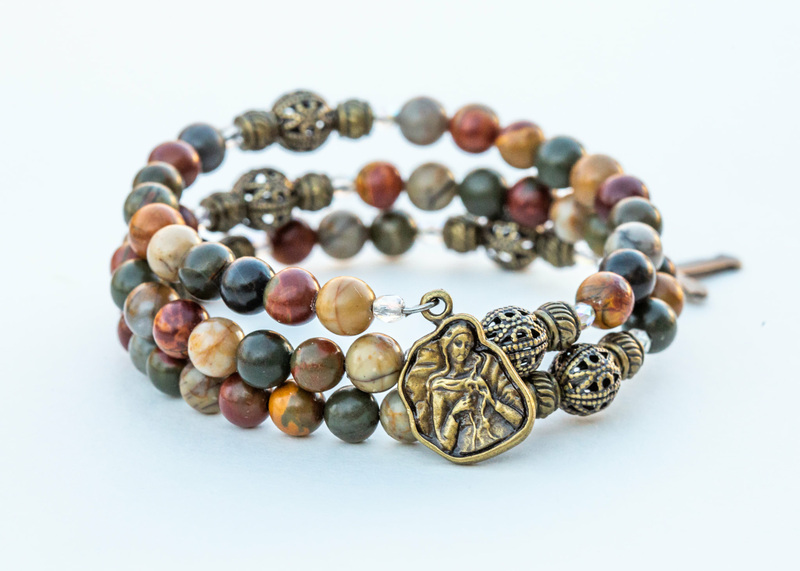 This woman's gemstone bronze rosary is made with49 strands of stainless steel, nylon-coated flexible wire. Aves are 8mm Snow Quartz gemstone beads, Paters are 12mm handmade Lampwork beads capped with antique brass bead caps. 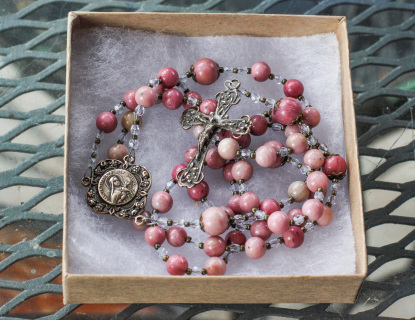 The 1 inch long rosary center and 1 3/4 inch long crucifix are solid bronze and are hand cast from antique vintage pieces. One of a kind original creation. 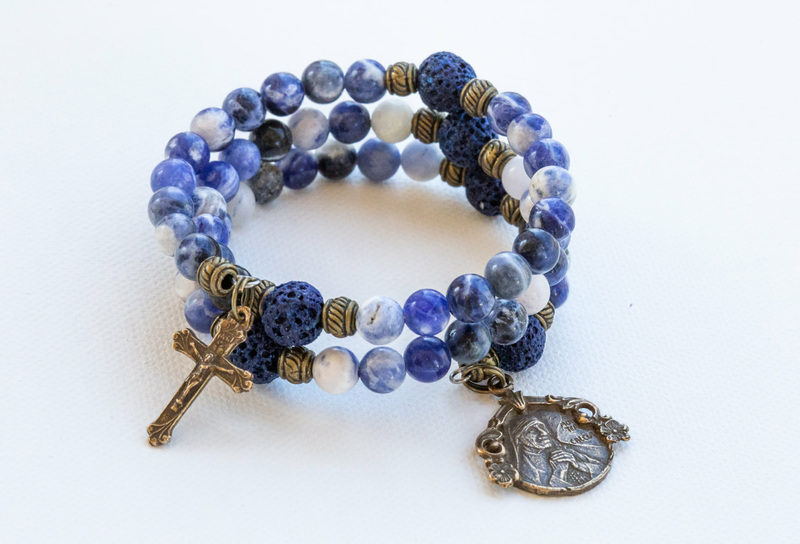 This is a Miraculous Medal rosary in solid bronze and beautiful Lapis Lazuli gemstone beads. 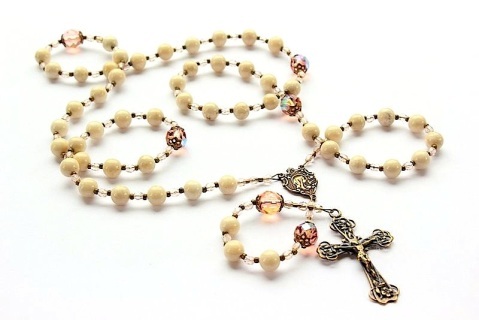 This is a full 5 decade rosary. The Ave beads are a 6mm Lapis and the Pater beads are 8mm Lapis with brass bead caps. The crucifix and rosary center are solid bronze. Each bead is individually linked with unbreakable 20 gauge wire. I hand make all the links, as well. This rosary will last a lifetime.